Castellammare del Golfo (Zip Code 91014) is 157 Km. distant from Agrigento, 200 Km. from Caltanissetta, 307 Km. from Catania, 220 Km. from Enna, 317 Km. from Messina, 58 Km. from Palermo, 293 Km. from Ragusa, 374 Km. from Siracusa, 41 Km. from Trapani, which province it belongs to. The municipality has 14.044 inhabitants and its area measures 12.715 hectares; its population density is of 110 inhabitants per square kilometre. The town rises on a hill zone nearby the coast, it is placed 60 metres above the sea-level. Castellammare del Golfo is a big agricultural and trading center; it is placed on a light slope at the end of the homonymous gulf. Its agriculture gives products such as: corn, legumes, grapes and greenhouse. In the handicraft field the woodworking has particular importance, and also the needle-work carried out on original and traditional patterns. 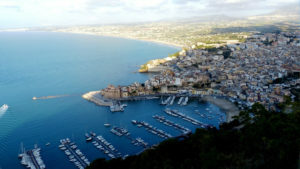 The name of Castellammare del Golfo derives from Latin Castellum maris (Castle at the sea). The town dominates the wide homonymous gulf, seat of the ancient emporium of the nearby Segesta, it was the main landing-place of Erice and Segesta during the pre-Hellenic period. Towards the end of the Middle Ages it became a stronghold. After the settling down of the tunny-fishing grounds and of the loader for embarking corn, the town played an important role for the main trading way towards the inside of the island. In 1560 it was the first village close to the Pietro di Luna’s castle. Still now Castellammare del Golfo is involved in a fairly good export trade of agricultural products and of tunned industry (tunny preserved in oil and salted fish). In the Cathedral Church, Madonna del Soccorso, it is possible to admire the valuable fifteenth-century frescos by G. Tresca and the beautiful majolica statue of the Madonna. A special importance is given to the Castle, probably of Arab origin which rises on an isthmus destroyed many times during the centuries. Nearby it is situeted Scopello’s (small rock) beach, an evocative little bay sheltered from the Faraglioni (jutting rocks standing out in the sea) and protected by old towers. The tunny-fishing complex stands in Scopello; it is full of ancient founds connected with the fishing which took place in it.